Spanish Courses and Content Courses since 1995, in one of Spain´s most modern and innovative universities, with around 30,000 students in a beautiful campus by the Mediterranean. 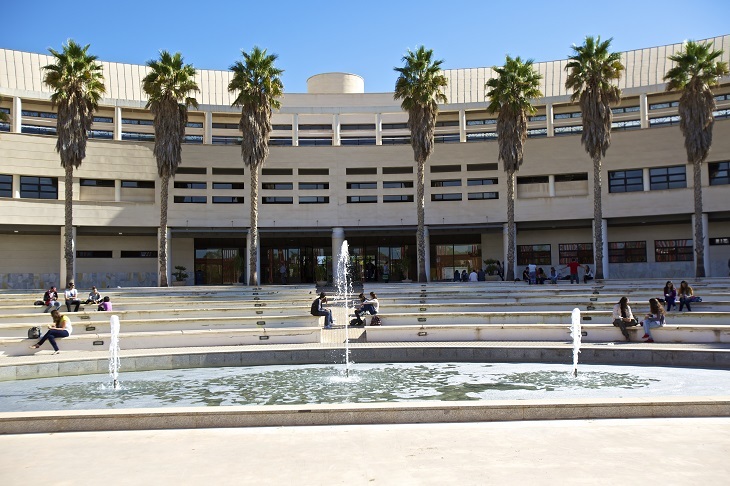 The University of Alicante Language Centre (Centro Superior de Idiomas de la Universidad de Alicante) has been one of Spain´s most popular destinations to study Spanish since 1995. The Language Centre is part of a university with 30,000 students studying one of 32 university degrees offered by the faculties and university schools. The campus features extensive grounds, with gardens, wooded areas and an artificial lake, only 4 km from the city centre. The University of Alicante offers an outstanding setting in which to study Spanish, with facilities including a museum, art gallery, indoor and outdoor sports stadium, restaurants and banks, making it one of the most beautiful and complete campuses in Europe. Enjoy and learn by the Mediterranean Sea. Alicante is a lively city on the Mediterranean Coast of Spain, with excellent national and international travel links, and is located at the heart of the COSTA BLANCA, one of the most acclaimed touristic areas in Spain. The city, the province and the University offer a range of cultural, academic and sporting activities, (including water sports) that make it a very popular destination for students of Spanish as a Foreign Language. Our classes are action-oriented, clearly focused on making learning a fun and enriching experience that you will share with students from all over the world. But we also want you to learn outside of the class: to make the best of your stay, we also offer a wide range of cultural, sport and leisure activities to meet Spanish and other international students and fully enjoy the life-changing experience of study abroad. Water sports are clearly our most popular activity, but cooking courses, trips, excursions, language exchanges, wine-tastings, cultural visits, participation in local festivities and traditions, they all lead to living the Spanish life at its best and having an actual real immersion experience. Dubbing in Spanish? Putting on a play? Our Spanish Courses (of all Levels) are designed to provide complete immersion in the Spanish language and its environment through the very experiences that students will live through both in class and elsewhere (projects, presentations, short films, subtitling, plays, blogging, drama, art, dubbing videos…), both in the Spanish classes and the Courses we offer as a complement for the Language classes: Film, Theatre, Art, Spanish for Tourism, Business Spanish, Spanish Culture and Spanish Gastronomy. All the intensive courses have university ECTS credits and all students have access to all university services and facilities. For those seeking a hands-on experience abroad. Alicante is a lively city with many internship opportunities, both using Spanish and English as a medium of work. Different combinations are available: Intensive Spanish courses or Semester courses in the morning and internship in the afternoon, an Intensive Spanish course when you arrive in Alicante and then a two-month internship. We will help you find the right place for your internship/volunteering experience, take care of all the steps in the process and, of course, the necessary follow up with both you and the company or nonprofit organiosation (NPO). Take either a Spanish intensive or a Spanish Semester course combined with one or two courses in a Bachelor´s Degree at the University of Alicante (direct enrolment/visiting student). We will not only take care of your registration process, but provide counselling / recommendation as to what is best for you. You must be a university student in your country to apply for direct enrolment / visiting status. You can study in Spanish or English. There are more than 150 courses taught fully in English, for those who have not yet reached the level of proficiency in Spanish required to take a course in a Bachelor´s Program in Spanish.